The Enduro World Series continues its proud tradition of uncovering the world’s best riding destinations as it reveals its 2016 calendar. The new season will once again feature eight rounds across three continents, including four completely new venues in Chile, Argentina, France and the USA. Next season is set to kick off in style as the series heads to Chile in March. After the success of the Chilean round in 2014, it seemed only right the EWS should head back to South America and revisit our great friends and organisers at Montenbaik. But this time the high mountains and iconic volcanic terrain of Nevados de Chillan has been replaced with the beautiful Patagonian coastline of Valdivia. The opening round of the season will feature two days of racing on incredible singletrack that heads all the way down to the South Pacific Ocean. 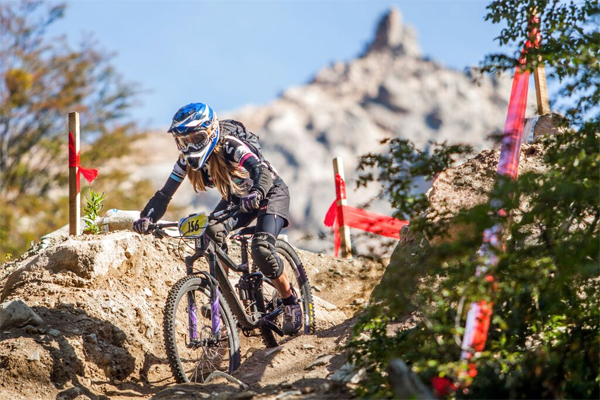 For round two in April it’s another Patagonian event, but this time the series makes its first foray into Argentina. The city of Bariloche sits amongst the Andes Mountains and riders will be blown away by the famous Cerro Catedral ski resort in the north Patagonian Andean Zone located within the Nahuel Huapi National Park. Bariloche offers the perfect mix of big mountain adventure against a backdrop of the region’s most celebrated and cosmopolitan town. In stark contract to Patagonia, May sees the series turn its attention to the rolling green hills of Ireland for a return trip to County Wicklow and the legendary biking.ie organisation. Ireland may not be home to the biggest mountains in Europe, but what it lacks in height it more than makes up for in character. Home to some of the craziest fans the series has ever seen, it’s safe to say riders will be pleased to see Carrick Mountain back on the calendar after this year’s incredible event. Fun will be high on the agenda at this one day race with a laid back vibe. Round four sees another popular venue make a welcome return, with the spectacular La Thuile back in action. Sitting just over the Italian border with France, La Thuile lies in the shadow of Europe’s most famous peak, the magnificent Mont Blanc. This small resort offers mile upon mile of natural Alpine singletrack. A firm favourite with riders when the series visited our Italian partners and great hosts Superenduro in 2014, La Thuile offers two days of classic lift accessed enduro amongst some of the Alps’ highest mountains. It’s over the pond to North America for round five and another new venue, Aspen Snowmass in Colorado. It may be world famous for its skiing and as a long standing host of the X-Games, but this beautiful area is now becoming known for its ever growing trail network. This two day race hosted by trusted friends at Big Mountain Enduro will feature more lift access terrain to alleviate some of the effects of the high altitude on the riders. The towns of Aspen and Snowmass are amazing mountain locations offering an exciting and almost European flavour of enduro whilst deep in the heart of the American Rockies. August heralds Crankworx in Whistler, Canada for round six. This most iconic of riding destinations never fails to impress with it’s myriad of famous trails flanking this great resort. A staple stop on the series, Whistler is truly one of the most diverse and challenging venues in the world. This epic race will once more push riders out their comfort zone and into some of the most spectacular scenery Canada has to offer. Round seven heads to Valberg-Guillaumes in France. This new addition to the calendar sits in the Southern Alps and is the oldest ski resort in the area. Whilst the venue may be classically French, the racing style won’t be. In a break from Tribe Events EWS tradition, the race will feature more pedal liaisons and less ski lift access than in previous years in order to challenge the riders and mix things up on some unique and stunning terrain that will differ greatly to anything seen before at a French EWS event. There is only one place the series can draw to a close in October, and it has to be Finale Ligure. This classic venue on the Italian Riviera features every year and with good reason - sun, sea and several hundred miles of singletrack. This rider favourite always delivers an incredible finish to the season, and this year athletes can once more look forward to two days of racing through ancient villages and towns before being rewarded with the obligatory dip in the warm water of the Mediterranean sea at the finish line.